In 2007, International Civil Aviation Organization (ICAO) Resolution A36-23 urged member states to put in place measures aimed at mitigating the threat of controlled flight into terrain (CFIT) during approach and landing for Instrument Flight Rules (IFR) aircraft. The risk of CFIT whilst on approach to landing is considered a significant aviation safety hazard. ICAO supports implementation of APV as mitigation against CFIT on approach to landing. The adoption of Approach with Vertical Guidance (APV) complements other aviation safety measures, in that it increases the likelihood that an approach to land will be flown in a stabilised manner with attendant reduction to the risk of CFIT. APV also provides effective mitigation against runway overrun by optimising the point of touchdown. The enabling technology for the vertical guidance component of APV currently is through the Global Positioning System (GPS) with Satellite Based Augmentation Systems (SBAS) or appropriate Baro-VNAV avionics supported by facilities and services providing an accurate aerodrome barometric pressure reading (QNH) for each approach. It is important to note that the addition of vertical guidance through Baro-VNAV to an otherwise laterally guided approach does not necessarily improve the landing minima available for a particular approach. However, in many cases the landing minima – the Decision Altitude (DA) in the case of a Baro-VNAV approach – may be lower (ie better) than that for a runway aligned RNAV GNSS approach (ie the Minimum Decision Altitude – MDA) at the same location. Safety is improved through significant gains in pilot situational awareness and less intense workload and operating techniques as a result of incorporating a stabilised descent rather than the stepped ‘dive and drive’ descent profiles otherwise common with laterally guided approaches. In October 2010, recognising that not all aerodromes or IFR aircraft would become suitably equipped for APV, ICAO superseded Resolution A36-23 with Resolution A37-11. This resolution supported member states implementing the use of straight-in LNAV approach procedures at those aerodromes where an APV Approach Procedure could not be designed to meet ICAO design criteria. Specifically, Resolution A37-11 calls for the implementation of straight-in LNAV procedures, as an exception to APV, for instrument runways at aerodromes where there is no local altimeter setting available and where there is no aircraft suitably equipped for APV operations with a maximum certified take-off mass of 5700kg or more. 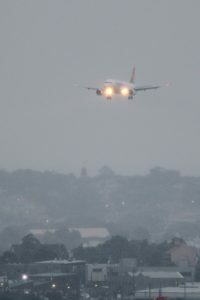 Noting that most air transport jet and many turbo-prop aircraft operating in Australia, estimated to be carrying more than 95 per cent of fare-paying passengers, are already equipped with Baro-VNAV avionics, there is a strong safety rationale for implementing Baro-VNAV approaches across Australia where it is practicable to do so. In this regard, Australia has already introduced some RNP-AR approach procedures utilising barometric vertical guidance. These are currently in use at 20 Australian airports for specific airframes and operators. Note: The list of aerodromes currently eligible for APV implementation will be updated regularly to report on progress with the rollout of Baro-VNAV procedures. Additionally, as implementation guidelines change and/or ground infrastructure is updated, this list will be updated to include any additional candidate locations from the ‘Aerodromes for future review’ list should these be identified as meeting the requirements for supporting Baro-VNAV procedures.